While Chinese smartphone manufacturer Xiaomi may have already kickstarted the development of MIUI 10, the company is doing its best to roll out MIUI 9 to all the eligible devices on time. Following the recent release of MIUI 9.2 for the 2016 Redmi Note 3, Xiaomi has now started rolling out MIUI 9.2.2.0 for the old Redmi 1s. However, the Redmi 1s, which was released back in 2014, is receiving MIUI 9 based on Android 4.4.4 KitKat, which means that it won’t receive any of the new features introduced in successive Android releases. 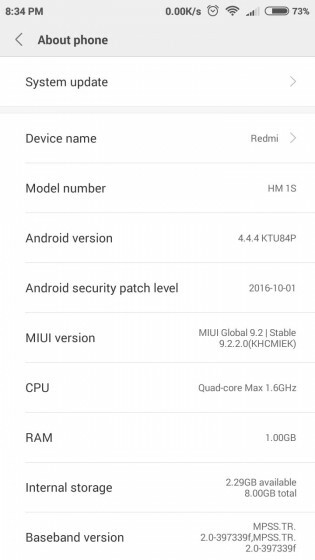 The MIUI 9.2.2.0 on the Redmi 1s will not include QuickReply, Multi-Window, and other features which were introduced in Android 5.0 and later. Additionally, the Android security patch included in the release is from October 2016, which means that it doesn’t include quite a few fixes, leaving the device vulnerable to security flaws. Even though the Redmi 1s might not receive a number of new features which are commonly found in modern smartphones, it will receive all the OS-independent features which are part of MIUI 9. Users who update their Redmi 1s to the latest version of MIUI will be greeted with the revamped UI, Quick Cards, and App Search feature that were introduced in MIUI 9. The update is rolling out in phases via OTA, so it may be a while before it becomes available to all users.